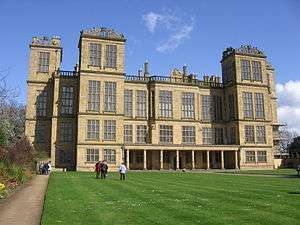 English Renaissance: Hardwick Hall (1590–1597), a classic prodigy house. The numerous and large mullioned windows are typically English Renaissance, while the loggia is Italian. 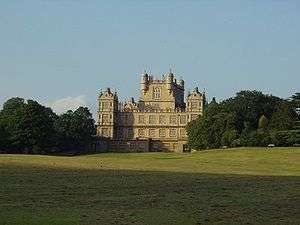 Wollaton Hall, Nottingham, England completed in 1588 for Sir Francis Willoughby by the Elizabethan architect Robert Smythson. Elizabethan architecture is the term given to early Renaissance architecture in England, during the reign of Queen Elizabeth I. Historically, the period corresponds to the Cinquecento in Italy, the Early Renaissance in France, and the Plateresque style in Spain. Stylistically, it followed Tudor architecture and was succeeded in the 17th century largely by its stylistic extension, Jacobean architecture, and to a limited degree by Palladian architecture, introduced in a handful of prominent commissions within court circles by Inigo Jones. In contrast to her father Henry VIII, Elizabeth commissioned no new royal palaces, and very few new churches were built, but there was a great boom in building domestic houses for the well-off. The most characteristic type, for the very well-off, is the showy prodigy house, using styles and decoration derived from Northern Mannerism, but with elements retaining signifiers of medieval castles, such as the normally busy roofline. The reign of Elizabeth saw growing prosperity, and contemporaries remarked on the pace of secular building among the well-off. The somewhat tentative influence of Renaissance architecture is mainly seen in the great houses of courtiers, but lower down the social scale large numbers of sizeable and increasingly comfortable houses were built in developing vernacular styles by farmers and townspeople. Civic and institutional buildings were also becoming increasingly common. 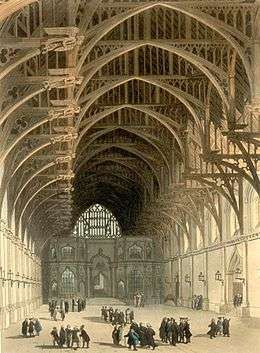 Renaissance architecture had achieved some influence in England during the reign of, and mainly in the palaces of, Henry VIII, who imported a number of Italian artists. Unlike Henry, Elizabeth built no new palaces, instead encouraging her courtiers to build extravagantly and house her on her summer progresses. The style they adopted was more influenced by the Northern Mannerism of the Low countries than Italy, among other features it used versions of the Dutch gable, and Flemish strapwork in geometric designs. Both of these features can be seen on the towers of Wollaton Hall and again at Montacute House. Flemish craftsmen succeeded the Italians that had influenced Tudor architecture; the original Royal Exchange in London (1566–1570) is one of the first important buildings designed by Henri de Paschen, an architect from Antwerp. However most continental influence came from books, and there were a number of English "master masons" who were in effect architects, and in great demand, so that their work is often widely spread around the country. In England, the Renaissance first manifested itself mainly in the distinct form of the prodigy house, large, square, and tall houses such as Longleat House, built by courtiers who hoped to attract the queen for a ruinously expensive stay, and so advance their careers. Often these buildings have an elaborate and fanciful roofline, hinting at the evolution from medieval fortified architecture. It was also at this time that the long gallery became popular in English houses. This was apparently mainly used for walking in, and a growing range of parlours and withdrawing rooms supplemented the main living room for the family, the great chamber. The great hall was now mostly used by the servants, and as an impressive point of entry to the house. Girouard, Mark, Life in the English Country House: A Social and Architectural History 1978, Yale, Penguin etc. Wikimedia Commons has media related to Elizabethan buildings.